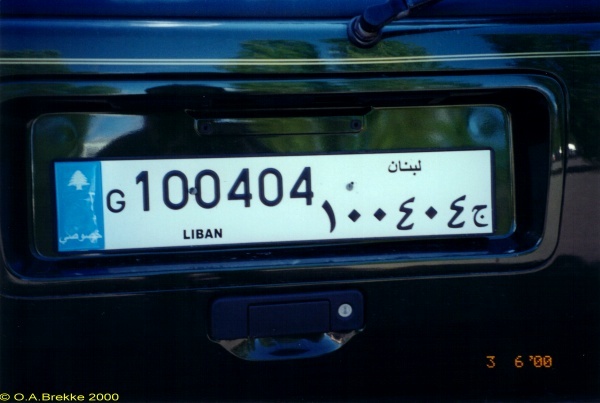 New style plates with the registration in only Western characters were introduced 21 December 2017. G 100404 Normal series since 1998. 1998-2017 plate style. G = Joûnié. Blue band at the left with the Cedar of Lebanon and "private" in Arabic. At upper right is "Lebanon" in Arabic. 4 161 CD Diplomatic series 1950s-98. 161 = listed as Gabon, but the driver said it was Norway. CD = Corps Diplomatique. 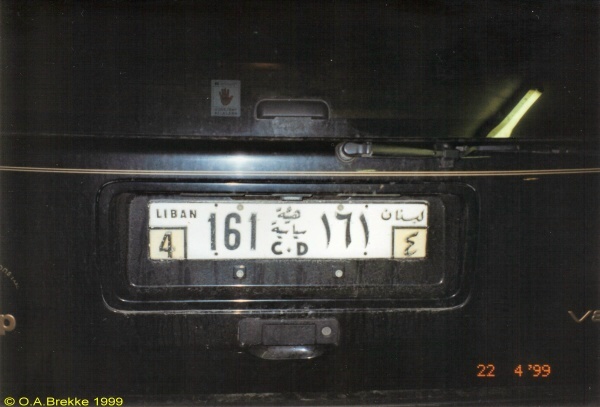 The Arabic text above CD is Diplomatic Corps, at upper right "Lebanon". 4 161 CD Close-up of the above.